A French onion tart that is similar to a pizza or a savory pie. It is often served as a main dish or an hors d'oeuvre in Nice, France where it originated. 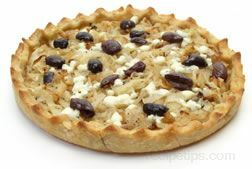 This food consists of a thin bread crust covered with a combination of thinly sliced onions (caramelized), Parmesan cheese, garlic, thyme, black olives, and pepper. The surface is then topped with pissala (hence the name of this tart), which is a fish paste made from sardines and anchovies. In Italy, this dish is referred to as pissaladeira.